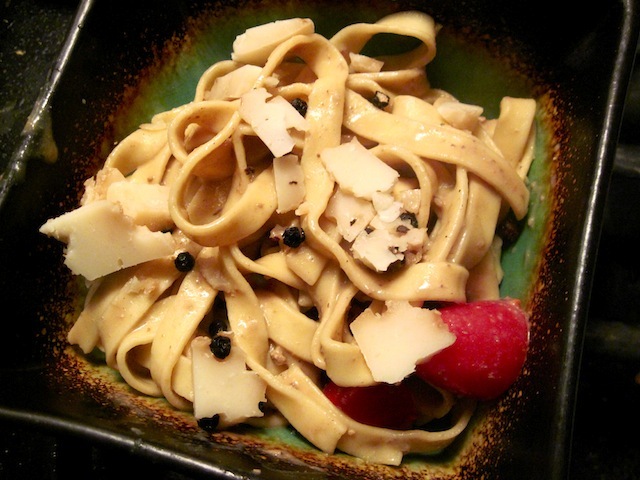 Dinner Stroll: Fettuccine with Chicken-Liver Sauce – Eat Me. Drink Me. 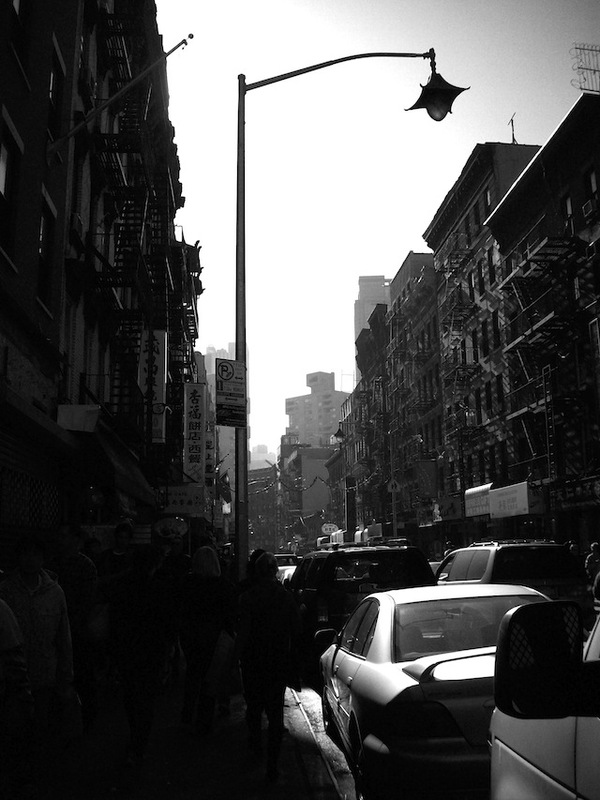 And especially walking in New York, I have these moments where I thrill that I live here. It’s a very special moment, to know where you are going, to know that after you leave your bank on Broadway and 10th, you can wander generally South and left (I actually do all my directions this way; I’ve mastered North and South, but I find East and West a little elusive), and you can pick up a bottle of cheap wine at the Broadway Liquor Warehouse, check on a new milk frother at Sur la Table and finally end up at your favorite pasta shop on Grand and Mulberry for fresh egg fettuccine and next door, a slab of Sicilian black pepper cheese. I feel most connected to places in which I’ve walked. Maybe this is why I’ve felt more at home in cities where I haven’t spent more than a few months total – Bremen in Germany, Melbourne in Australia – than in the town where I grew up. It’s when I have the map in my feet that I think of a place as home. I’ve had the last two days off work, and it’s luxurious. I love running errands without a time constraint, and I tend to get more done when I don’t feel pressured to do as much. I’ve also cooked a lot. I had leftovers from Thanksgiving still – a whole pumpkin threatening collapse, chicken livers from a walnut and apricot stuffing, plenty of fresh herbs, shallots, and lots of other fancy things I don’t usually keep in stock. And so, in between the Laundromat and the post office, I found time to make a pumpkin-turkey soup, roasted pumpkin seeds, and pasta with liver-butter sauce. Cutting liver is unpleasant, like slicing a squeegee or hearing the accidental squeal of a piece of chalk across a board. You can feel liver resisting the knife. And badly prepared liver is ungrateful. It is grainy and dense and dislikes being chewed as much as it didn’t want to be cut. But good liver – good liver is my truffle. Buttery, earthy, deep and graciously forgiving. Learning to love liver is much like discovering a place. At first, unknowable and a little off-putting. Resistant, careful of its secrets, but approached with persistence, patience, and the desire to understand, yielding to the chef’s knife, the walker’s feet. I cook the way I walk, a destination in mind but a less fixed route for the travel. 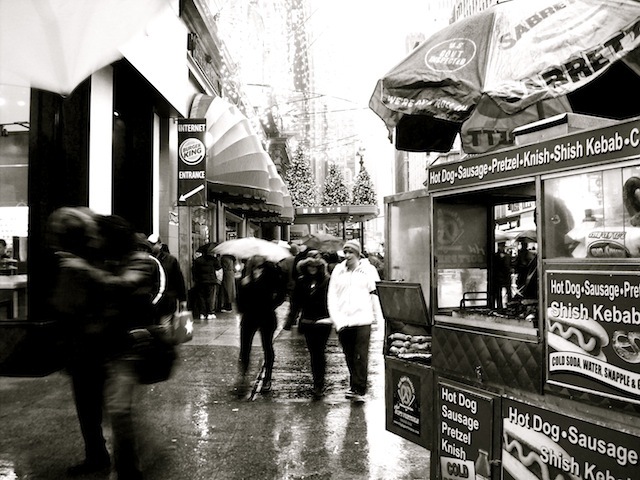 This way, I keep myself open to learn the secrets of a city or of a dish that harried preoccupation never reveals. And so, as I run from one fire alarm to the other, I think, it’s not so bad; I know the secrets of my hallway well. Adapted from Food & Wine, December 2010. 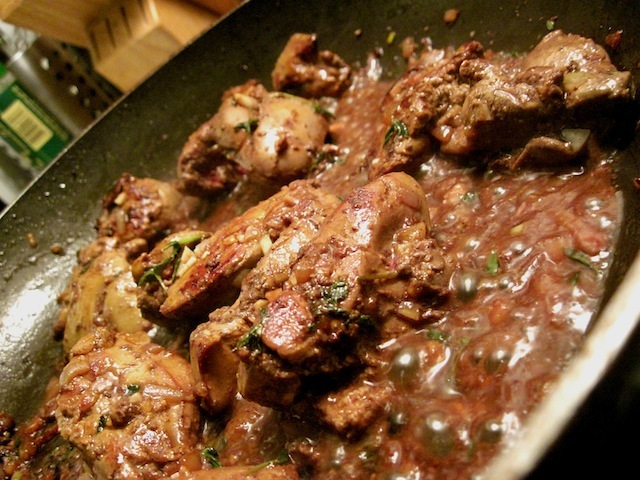 Place the chicken livers in a bowl with the milk and let soak for 1 hour. Drain and pat dry. Heat oil in a large skillet, then add chicken livers and cook on high until the bottoms are lightly browned. Turn the livers. Add shallot, garlic, and thyme and cook until fragrant, about 2 minutes. Add sherry and cook, scraping up any bits sticking to the bottom of the pan until the liquid evaporates and the livers are cooked through, about 2 minutes. Throw the whole mix into a food processor and blend until chopped. While the machine is still on, add butter in cubes and puree until smooth. Transfer the mixture into a bowl and season with salt and pepper. Cook pasta until al-dente in a large pot of salted, boiling water. Drain, reserving 3/4 cup of the cooking water. Return pasta to pot, adding chicken-liver butter, tomatoes, and reserved pasta cooking water. Bring to a simmer over medium-low heat, tossing until pasta is coated in creamy sauce. Serve immediately.